We have looked at various ways of understanding consciousness in the first and second post in this series. Now we will try to understand consciousness from an evolutionary standpoint. Reviewing evolutionary consciousness will help us better understand how consciousness has developed over time. Science has theorized that love is evident in the first mammals as mothers cared for their young. Love however should not be confused with an animal’s desire to procreate and continue the species. The higher emotion of love is relatively new for humans. This love is described as a willingness to sacrifice one’s own life for the sake of another. Marriage for a long time was traditionally determined by factors other than love. It was either prearranged based on tradition or was largely based on economics. The ability to share in the work necessary for surviving and raising children were the key drivers in these unions. The most primitive parts of our consciousness are the remnants of our animal traits. These traits are based on protection and involve instincts and reactions; the most well known of these reactions is the fight or flight response. This instinct is triggered whenever someone feels threatened. The immediate instinctual response is a surge in adrenaline giving a temporary boost in strength that allows one to either run away or fight. In all cases it is situations in the outside environment that invokes this internal protection response. 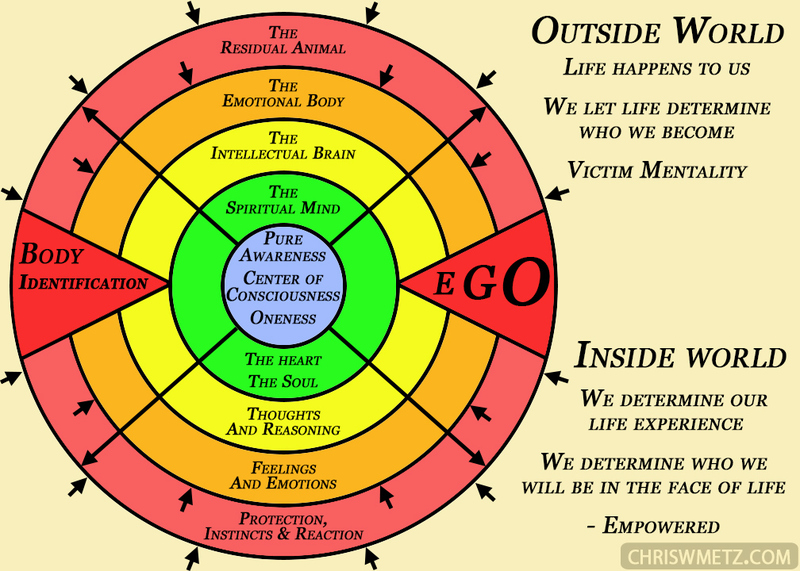 If we review the diagram this represents the outer most layer of consciousness. This is the residual animal consciousness. Here we are using the five senses to assess physical threats and then reacting to them. In this process there isn’t a lot of internal rational thinking that goes on, only instinctual reactions. In the first post shopping example, being shoved and threatened invokes an immediate “fight” response. Fear or aggression is the main response to external stimuli in this outer ring. This residual animal level also contains the characteristics of the alpha male, selfishness, tribalism, jealousy, rage and territorialism. One need look no further than the primate habitat at a zoo to witness these residual animal traits. As we have evolved there is a segment of humans who no longer allow their emotions to control their lives; effectively overcoming their emotions. Rising above irrational emotions requires some intellectual reasoning. At this level a person becomes objectively aware of their emotions and starts to detach from them. They realize while some emotions are useful, emotions are responsible for all the drama in life. Most importantly, by allowing emotions to effect our judgments we realize truth can get distorted based on how one feels about something. In order to deal in just the facts of a situation, one has to put emotions and feelings to the side. The intellectual brain realizes that life is an experience and we have a certain amount of control over that experience. This control is mainly of ourselves, our emotions, and our interpretations and reactions to life. Utilizing the power of thoughts and reasoning we resolve problems and utilize our will to create our ideal life. At the highest level of the intellectual brain, people can almost seem cold and distant. They rarely display any irrational emotions and they can be limited in their ability to emphasize with others. Rather than interpreting life’s events with feelings and emotions, everything is looked at rationally as a set of causes and effects. 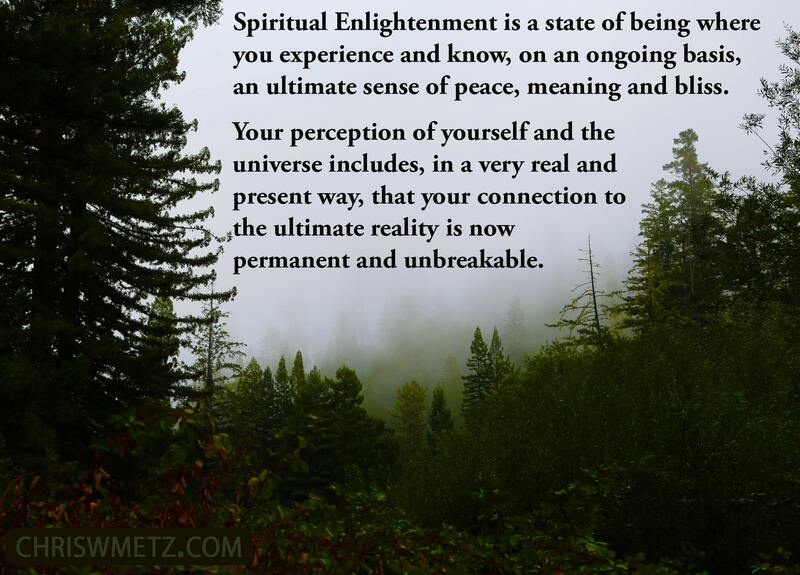 A very small segment of humans have evolved to the spiritual mind phase of consciousness. This evolutionary consciousness phase has been reached mainly through spiritual practices and religions that promote higher level consciousness. It has started to occur in a small number of people in the west in just the last 100 years. This is the new age spiritual movement that has gained popularity as people have rebuffed traditional religion and have sought to learn more about eastern religions. Meditation, the Tao, the Vedas, Zen, Yoga, Buddhism, etc.., have helped in showing people a path to higher levels of consciousness. While higher levels of consciousness will eventually evolve over time, people are starting to use their spiritual will to accelerate the process within themselves. At this level love, compassion, gratitude and peace are at the forefront of consciousness. These traits are first and foremost directed inward towards oneself. Only after they have been experienced by the self can they be directed outward. The aspect of the soul along with life being continuous becomes more conscious in the individual. This higher self is expressed through the heart as the ego is subdued. Consciousness at this level is that of unity and caring for the welfare of others. Fear is no longer a predominant emotion if it exists at all. As one reaches this level of consciousness the belief in death no longer exist. This level of consciousness represents the pinnacle of consciousness reached by man. Very few throughout recorded history have attained this center of consciousness. Here individual consciousness merges and is aware of the one unifying consciousness. Little is written on this level because it has been termed indescribable. The awareness of all things and the nature of consciousness itself is experienced in this level. It is said that one becomes the observer and the observed. There is a complete sense of oneness with all that exist. Can you sense this primitive outer level of consciousness in your life? Do you see how fear is the base of evolutionary consciousness? Can you sense how aggression is the next step up from fear? Can you get a sense of how this primal level of consciousness was established as a means of protection and reproduction? Can you see how emotions are the next phase in evolutionary consciousness? Can you view all emotions from an evolutionary standpoint to see how certain emotions could have been advantageous to survival or reproduction? As consciousness developed, can you see how emotions allowed us to further experience our own individual consciousness? If we are protecting this “image” of ourselves, do you see how it can only be done by identifying with the body itself. Do you know of someone or have you experienced yourself how rational intellectual thinking starts to overcome an emotional state? In the next post of this series we will look at the work of David R. Hawkins and his levels of consciousness. To go there now click here. This entry was posted in Calming The Mind Within, Ego, Enlightenment and tagged consciousness, ego, emotions, Personal Growth, self-awareness, victim mentality. Bookmark the permalink.